I am already 7 months pregnant! but I swear I am already feeling the discomforts of third trimester pregnancy! into Snow City @ Science Center. "What the HECK is a pregnant women doing in Snow City!!" It was exhilarating seeing the trio having so much fun! without the up-tight "sergeant major" mummy screaming in the background! the place look smallish with the tube as the ONLY star attraction! The kids seems to think otherwise. 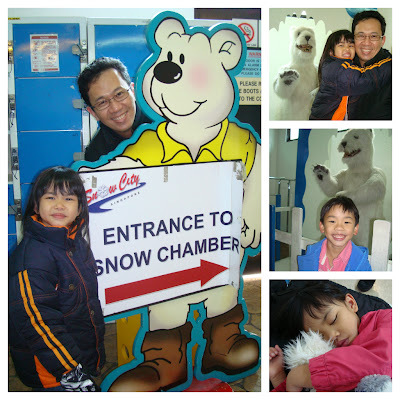 They simply adore Snow City! I am putting this place as a MUST GO for kids who has never seen the real thing. Tips: Bring a couple more pairs of dry socks, towel, and a change of clothes!